A research team from the University of Glasgow has developed a new way of harnessing solar energy to power ‘synthetic skin’. This could result in the creation of advanced prosthetic limbs capable of bringing back the sense of touch to amputees. 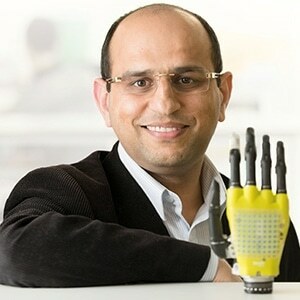 The engineers have previously designed an ‘electronic skin’ covering for prosthetic hands that were manufactured using graphene, and now have discovered a way to apply some of graphene’s extraordinary physical properties to use solar energy to power the skin. Graphene is a very flexible form of graphite, and although being just a single atom thick, is stronger than steel, transparent, and electrically conductive. It is the optical transparency of graphene, which allows about 98% of the light that strikes its surface to travel directly through it, thus making it perfect for collecting energy from the sun to produce power. The research paper, published in the journal Advanced Functional Materials, illustrates how Dr Dahiya and colleagues from his Bendable Electronics and Sensing Technologies (BEST) group have managed to combine power-generating photovoltaic cells into their electronic skin for the first time. Human skin is an incredibly complex system capable of detecting pressure, temperature and texture through an array of neural sensors which carry signals from the skin to the brain. My colleagues and I have already made significant steps in creating prosthetic prototypes which integrate synthetic skin and are capable of making very sensitive pressure measurements. Those measurements mean the prosthetic hand is capable of performing challenging tasks like properly gripping soft materials, which other prosthetics can struggle with. We are also using innovative 3D printing strategies to build more affordable sensitive prosthetic limbs, including the formation of a very active student club called ‘Helping Hands’. Skin capable of touch sensitivity also opens the possibility of creating robots capable of making better decisions about human safety. A robot working on a construction line, for example, is much less likely to accidentally injure a human if it can feel that a person has unexpectedly entered their area of movement and stop before an injury can occur. The new skin needs just 20 nanowatts of power per square centimeter, which is easily realized even by the least quality photovoltaic cells available on the market. But at the moment, energy produced by the skin’s photovoltaic cells cannot be stored, the team is already searching for ways to divert unused energy into batteries, thereby allowing the energy to be used whenever required. The other next step for us is to further develop the power-generation technology which underpins this research and use it to power the motors which drive the prosthetic hand itself. This could allow the creation of an entirely energy-autonomous prosthetic limb. We’ve already made some encouraging progress in this direction and we’re looking forward to presenting those results soon. We are also exploring the possibility of building on these exciting results to develop wearable systems for affordable healthcare. In this direction, recently we also got small funds from Scottish Funding Council. The research paper is titled ‘Energy Autonomous Flexible and Transparent Tactile Skin’, and the research received funding from the Engineering and Physical Sciences Research Council (EPSRC).